Click to Tweet is a free WordPress plugin that makes it easy to add tweetable quotes to your posts and pages. After installing this plugin on your website, you can then start inserting small pieces of text in your content, which are published with a click to tweet link. If you or one of your readers clicks on that link, a Twitter window will open, with a pre-populated tweet. This tweet includes the text you specified when creating the link, as well as the URL of the post or page, and your Twitter handle. 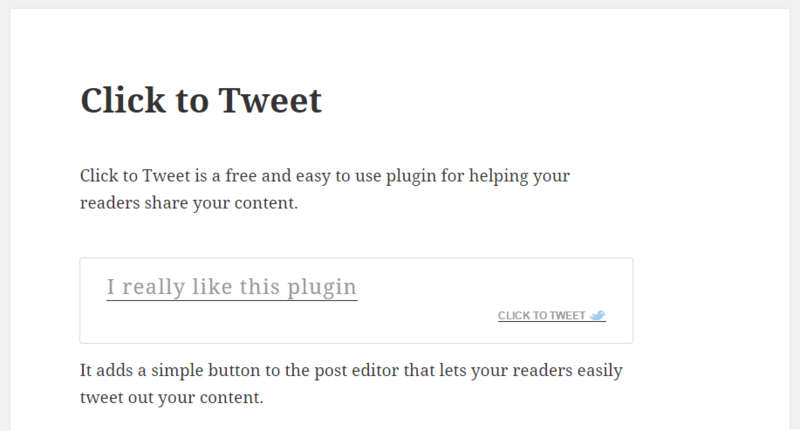 The plugin adds a handy icon to your WordPress editor which makes creating the clickable tweets very easy. One popular blogger who often uses this technique in their posts is Chris Lema. If you are looking for a way to help your content get more exposure on Twitter, then the free Click to Tweet plugin from CoSchedule is a great choice. As the Click to Tweet plugin is free to use, it can be installed on your site directly from the WordPress plugin directory. From the Add Plugins screen, enter âClick to Tweet’ in the search field, and then install the first item listed in the results. Once the plugin has been installed and activated, you can configure the plugin from the Click to Tweet item that has been added to the settings sidebar menu item. The only setting for the plugin requires you to enter your Twitter handle. This ensures that when one of your quotes is tweeted, you receive a notification. This then gives you an opportunity to thank the tweeter and start a dialogue with them. Creating the Click to Tweet quotes couldn’t be easier. Simply click on the icon the plugin adds to the WordPress editor, to open the dialogue box. Then enter the message you would like to be tweeted out when your readers click on the link. The tweet message will then be inserted into your content, using the shortcode associated with the plugin. You are then free to edit the tweet message directly should you need to. Now when you preview or publish your post, you can see the clickable tweet quote in action. When anyone clicks on that link, they can approve the message and then share it with their followers on Twitter, helping your content get more attention on this popular social network. You are free to add as many clickable tweets to your posts and pages, helping to increase the chances of your readers taking action. Click to Tweet is a simple but effective plugin that should fit right into your social media promotion toolkit. If you are looking for more ways to help promote your content on Twitter, check out our previous reviews of the Tweet Wheel, Twitter Cards, and Revive Old Posts plugins. What app does this click to tweet function, but also makes it easy to share on facebook, instagram, and pinterest?